On Tuesday, I found I couldn’t resist the siren call of Sanford, NC any longer. I made my semi-annual pilgrimage to Big Bloomers Flower Farm. 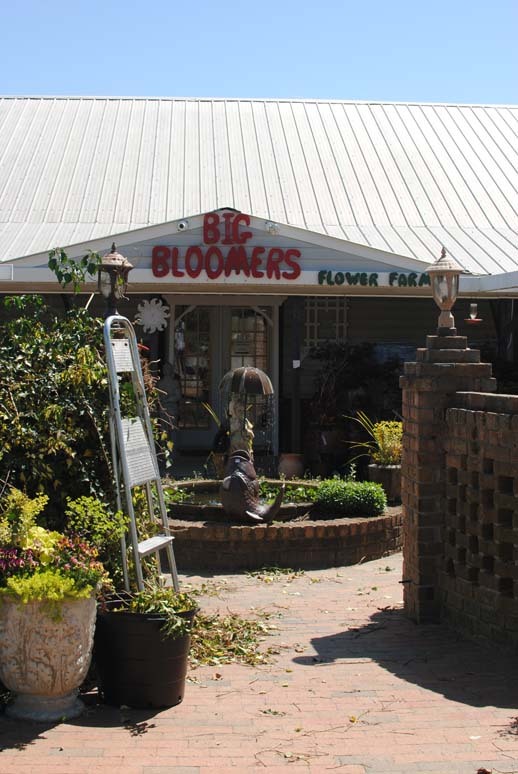 Apart from having one of the greatest names for a nursery that I’ve ever heard, Big Bloomers is spectacular for the variety of plant material they offer. It’s essential to go with a plan and to try your best to stick with it. I’ve never succeeded. I try to remind myself that it’s not far down the road and I can go more than twice a year if I want. That helps only a little bit. This trip, the plan was to get material to finish out the blue slope bed, to extend the new pink-purple-and-yellow bed in the far back of the garden, and to find the one or two (or half-dozen) things I spotted during my winter reading of Beth Chatto‘s inspirational volume The Shade Garden, that I clearly could not carry on without. Heaven comes in a 4-inch plastic pot. I made it as far as the second greenhouse (out of 17) before I deviated from the plan. I had forgotten that I needed something to go in the pair of new urns I bought a week or two ago. So into the wagon went two Hosta ‘Pilgrim’ and two Lysimachia congestifolia ‘Aurea.’ I picked up three Ipomoea batata ‘Blackie’ sweet potato vines to fill in the space around all the blue-foliage plants in the slope garden, and added two Phormium ‘Black Rage.’ These are evergreen perennnials, hardy in zones 8-10 (technically, I’m in 7b, but I have lots of mulch). It grows 2-3 feet high and purports to have blue-black swordlike leaves. Right now they’re thin and bronzy-brown, which works just fine also. I can’t wait to see how they do. I had a pot of Lavandula angustifolia cuttings that I propagated when I sheared it back sometime in January or February. The original plant hasn’t yet bloomed for me in the three years I’ve had it, but its silvery-gray foliage will look marvelous on the slope with or without blooms, so it will fill in a broad swath of the slope. I amended the bed last year with plenty of local grit and lime. Lavender grows very well here given those conditions, especially if you mulch it with gravel. That’s another task to add to the to-do list. I didn’t even go in the iris greenhouse. Lead me not into temptation. And I bypassed the daylilies; I have plenty of those for now, thanks to Jim Massey. The next greenhouse, however, makes up plenty for the iris house. Ferns. What bliss. Nothing is more restful to look at than well-grown ferns. Alas, I am lacking a creek running through my property, so I can’t grow them the way I would like. That doesn’t mean I won’t try. Into the cart went six Athyrium nipponicum ‘Pictum-Appelcourt’, the Japanese painted fern ‘Appelcourt.’ These grow to 12-24 inches tall and it is alleged that they will spread. I certainly hope so. I have resisted Japanese painted fern until now because although they’re quite beautiful, the independent (obnoxious, stubborn) side of me felt them to be a bit trite. I thought this, not because every gardener I know has them, but because every gardening magazine I pick up seems to push them at me relentlessly. While I like unusual plants, I heartily dislike being told what to do or grow even more. However, as is not infrequently the case, the Independent Gardener on my one shoulder, encouraging me to experiment with the exquisite, moisture-craving Athyrium filix-femina yet again (“Maybe this one will be the one who’s not thirsty!”) got shouted down by the Pragmatic Gardener who reprimanded me from my other shoulder, “Stop throwing money down the toilet.” I am sure the Athyrium nipponicums must be resilient little characters. They have outlasted me, anyway. Part II will follow soon; this is only about a third of the way into the adventure! This entry was posted in Uncategorized and tagged perennials by missinghenrymitchell. Bookmark the permalink.